Last chance: We only have 4 left - This product will not be available again once our stock runs out. Add Some Fizzy, Colorful Fun to Bath Time! 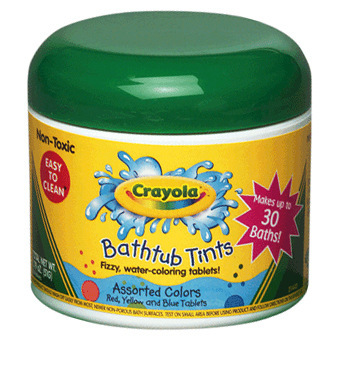 Size (inches): 2.76" X 2.76" X 2.76"
Crayola Bathtub Tints makes bath time more colorful with millions of colored, effervescent bubbles that stream out of tiny tablets. Kids can mix color tablets to create different colors every time. Bathtub Tints contain no fragrance or soap additives and are non-toxic! Includes 30 non-toxic, easy-to-clean tablets in assorted colors (red, yellow, and blue) for up to 30 baths! Non-Toxic. Lab Tested Safe. Non-irritating. Bathtub Tints contains no fragrance or soap additives. Bathtub Tints was tested by an independent laboratory and found to be non-toxic and non-irritating to the skin or eyes. As with all bath products, parental supervision is recommended. Used as directed, Bathtub Tints will not leave a residue on a clean tub that is in good repair and free from dirt and oils. Moist hands could activate tablet. Wash with soap and water. When used as directed, Bathtub Tints did not stain towels or other linen or textile products. Keep out of reach of children, except under parental supervision. My neice bought these for my daughter who is 3. Bath time could be somewhat of a hassle until we discovered these wonderful little things. Now my daughter can't wait to hit the tub at night. Also as promised, they don't stain a thing. My son was given a small jar of these from church. He and his older sister enjoy them so much I can't keep them out of the bath tub now. They love to see what color they are going to get at bath time. Great tablets turn bathwater different colors!! My daughter LOVES it! Thankk You! !